Electronic duo Galantis, formed by the union of prominent Swedish pop producers Bloodshy and Style of Eye, have broken through to the mainstream with the release of dancefloor-conquering single “No Money”. A year and a half later, the track appears on the duo’s second studio album, alongside some more sugary, high-octane dance tracks. 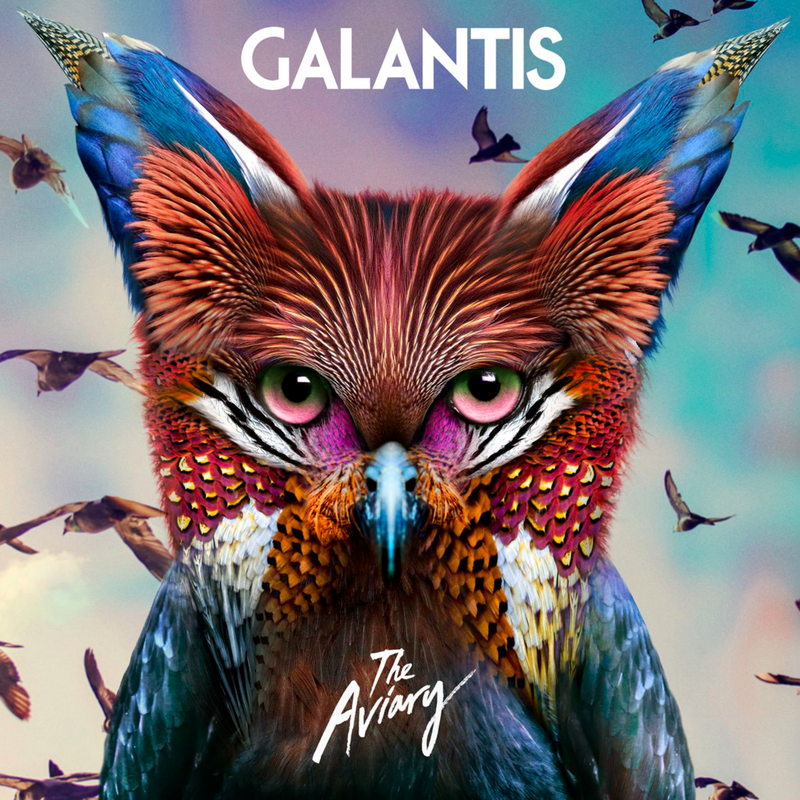 The Aviary is built like a standard pop album – scores of writers, repetitive, catchy hooks and the like, but is all infused with Galantis’ trademark vocal manipulation and glitchy, chiptune-emulating drops. For the most part, the album straddles a fine line between cheesiness and euphoria, more often than not falling into the former camp. These are guys who have worked with everyone from Charli XCX to Madonna, and know more than a few tricks to hook listeners into a dumb pop song. On quite a few occasions, however, the duo’s gimmicks just wind up being obnoxious. It’s strange – every time one of these songs started, my mind quickly snapped to a position of skepticism as they repeated the same tried and true tactics. This position didn’t change very often, but eventually, a few of them gradually began to win me over. With every party-ready drop and shouted background “hey!”, Galantis are asking you to join them on the dance floor. Galantis at their best is a overwhelming surge of joy stemming from those catchy synth melodies and pounding bass. At times, the pitch shifting of the vocals makes it tough to identify even the singer’s gender, and while certain effects can get very annoying quickly, I have to say that the intentional namelessness here helped to bring me into the sense of a universal dance party. Tracks like “Tell Me You Love Me” and “Love On Me” take the rare step further, adding a welcome extra dimension to these tracks that pushes them over the edge. The former slides the listener nicely into a chorus that builds up with some ascending horns and harmonies that sound like they’re straight from a gospel choir. The vocals are soulful and pleading despite their modulation, and as every little guitar riff or synth swell is added, it just widens my smile. “Love On Me” got me with the steel drums, and then got me even harder with the surprise of keeping that infectious chorus going overtop of the dance drop. I can only imagine what my reaction in the club would have been. “Salvage (Up All Night)” even shows some variation in their dance drops, interestingly basing it around a chopped vocal and switching up the rhythm halfway through. For a band trying to be so fun, you’d think they’d try more fun tricks like this. Far too many of these tracks feel like a copy and pasted checklist of your standard dance-pop song, sometimes applied without any attention to detail and creating awkward mishmashes like “Girls On Boys”. I expected more from a ROZES feature – she made even The Chainsmokers good – but when the song unexpectedly morphs from a softer-toned ballad with chords that accentuate her voice nicely to an all-out techno attack that comes in a measure too late and repeats an annoying higher-pitched synth melody, it just seems like the duo is relying in their audience to respond to a gimmicky dance breakdown regardless of what it is. This sloppiness pops up again on “Hello”, where the vocals seem like a total afterthought over a few piano chords that I’m certain I heard on another track here. They never quite click together rhythmically, as the duo compensates for this by cutting the whole track with a quick swooshing noise and another formulaic dance drop. Galantis’ formula is undoubtedly an effective one on the dance floor, but these tracks sound laughably similar when placed next to each other. Galantis also don’t seem to understand how much an extended gimmick can bring down one of their songs, but hey – these are the ones that are selling. The vocals are pitched up WAY too high on singles “Hunter” and “No Money”, and getting through these choruses verges on excruciating. “Hunter” especially is one of their most low-key tracks, giving more than enough spotlight to that chorus repeating on and on like a mosquito buzzing in my ear. I probably shouldn’t be expecting lyricism from a duo that relies so heavily on huge dance breaks, but you can’t help but notice them when they try to calm things down and go for an introspective angle. Wrabel taps right into that well of “aw, shucks” on – somehow – the 2nd track with the terrible title “Written In The Scars” I’ve heard in the past couple weeks (Thanks, The Script). Ultimately, my feelings on The Aviary are very mixed. The duo display infuriatingly small glimpses into their huge potential. Their “fun” formula is making them very successful at the moment, but that priceless jolt of surprise when they try something different is so much more fun.